These 3D paper snowflake ornaments are beautiful! They cost almost nothing to make. All you need is paper, glue, and thread. The snowflakes would look good hanging from a window, or you could take the traditional route and place them on a Christmas tree. A Christmas tree decorated with only white paper snowflakes and lights would add beauty and drama to any home decor. So pretty! Many people enjoy making handmade gifts and ornaments during the Christmas holidays. 3D paper snowflake ornaments are relatively quick to make, and almost everyone can achieve professional results. I will admit that a little bit of patience is required when assembling the snowflake pieces, but the end results are worth it. Cut 4 snowflakes with an electronic die cut machine. You may have to clean up some of the flakes with a small blade pair of scissors. It is possible to make these paper snowflake ornaments by hand, but you are warned, they will take a long time to cut out by hand. 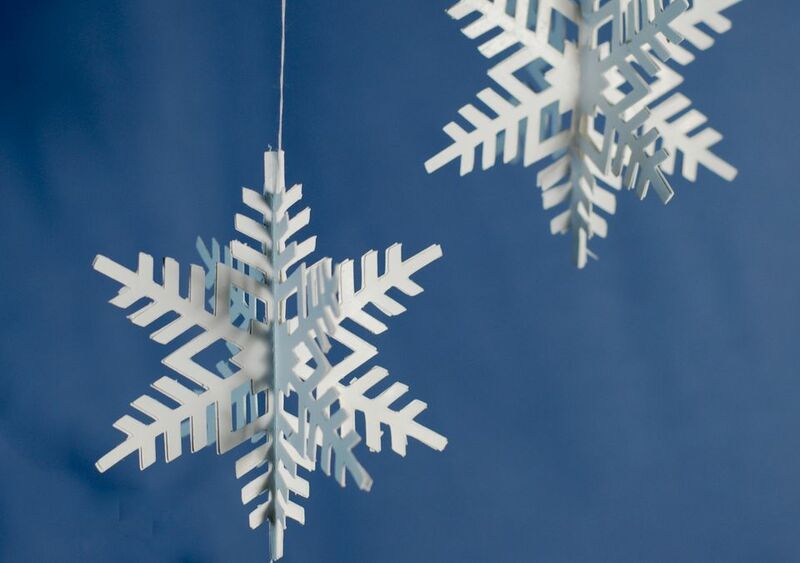 If you are cutting these snowflakes out by hand, print the pdf template onto an 8.5 x 11 sheet of white card stock then use an X-Acto knife to cut out the snowflakes. Fold each of the four snowflakes in half. * A quick tip. It may help to use a bone folder and ruler to run a score line down the middle of the snowflake and then fold the snowflake in half. Apply glue with the glue stick to one half of a snowflake. Press a second folded snowflake onto the glued side of the first snowflake and press together using the photo above as a guide. Cut your thread or string to your desired length and run the string over the glue stick. Place the string in the center of the ornament as in the photo above. Glue half of the third snowflake and attach to the other two glue snowflakes as in the photo above. Glue both sides of the remaining paper snowflake a attach to the ornament as in the photo above. You should now have a beautiful 3D snowflake ornament which is ready to hang! Paper Christmas Trees This papercraft was meant originally to be part of a miniature village display, but it is pretty enough to be used as a stand-alone Christmas decoration.